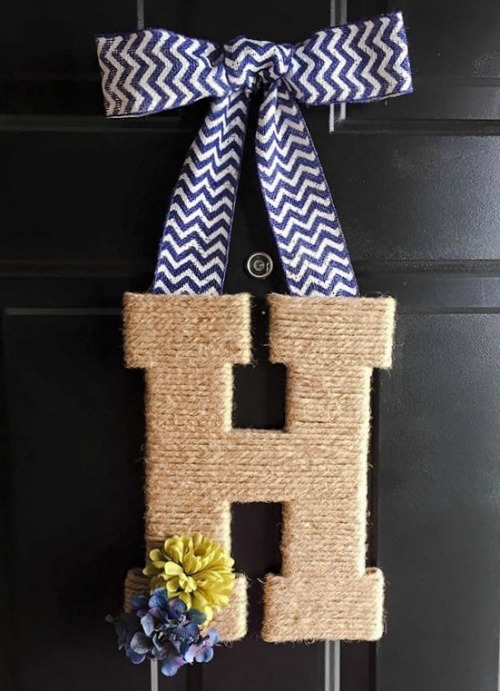 Wooden monogram letters are everywhere in interior design, so why not hang one on your front door? 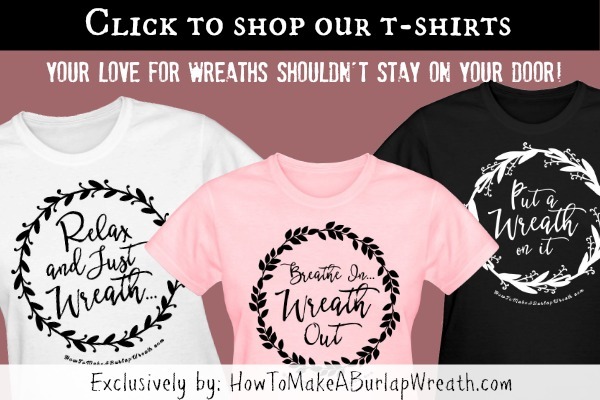 All year- around wreaths are a must-have item for any wreath fan. One great project that is also inexpensive and quick to make is a wooden monogram letters wreath. 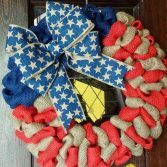 It looks gorgeous hanging on a door and it is perfect for all seasons. 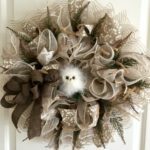 The steps that you need to take for making this wreath are easy to follow and you can modify it so it beautifies your home in the best possible way. We love this wedding inspired monogram wreath idea! 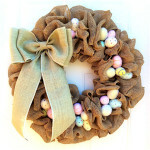 You can find the link to the wreath tutorial video here. Take your wooden letter and choose the direction you want to wrap your yarn/twine (you can go horizontally or vertical), than start wrapping it with it, using every now and then some hot glue to secure the material to the letter. Try not to leave any blank spots. If you want your letter to have sections with different colors, just cut the yarn or twine at the point you want the next color to start and continue with that color. Once done, you can wrap it once more to make sure you have a nice finish. You can alter the wrapping direction or continue in the same way. When you are happy with the look of your letter, it’s time to add your embellishments. 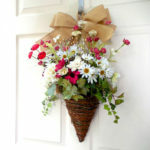 Rustic or silk flowers look great with twine, but you can choose whatever you believe will suit your home. Use twine/yarn or hot glue to secure them to the letter. 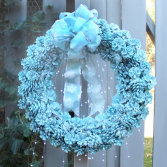 Tie the ribbon into a bow and glue the ends together so you can hang your wreath. Add flowers and a pretty ribbon for a decorative touch. 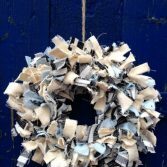 Initial wreaths are wonderful especially for a family home. It would make a fantastic gift for a newlywed couple as well and a thoughtful home warming item, too. Monogram letters are easy to find at any craft supply store, but if you want, you can even make one by yourself. Just use some sturdy cardboard and cut out the desired letter. To add to its sturdiness you could cut out more than one of the same letter and glue them together. 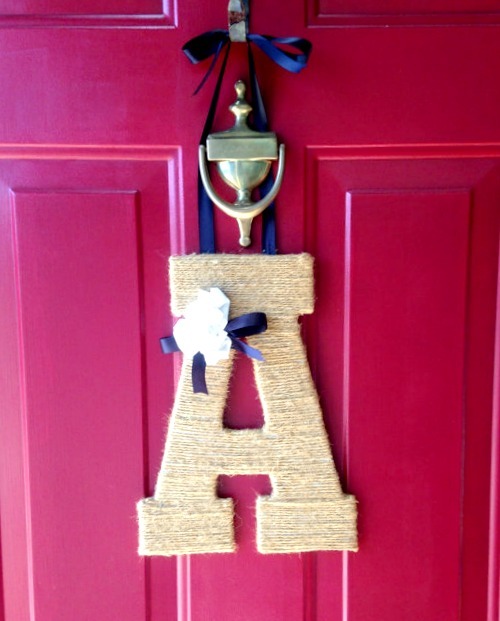 We love this jute monogram letter wreath idea! 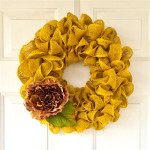 No matter what the occasion is, door wreaths are perfect to celebrate a season, a holiday or even some special event. 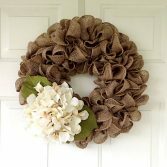 You can find supplies to make a wreath in most if not all craft stores or at the hobby department of a bigger store. An online search may give you even more options to find what you need. If you’re looking to find a quick, easy and cheap project for a weekend, making a wooden monogram letters wreath is the way to go. The supplies are really easy to gather and if you start it, you will end up with a long lasting, beautiful decoration item in no time. For more all-year around wreath tutorials try this wood slice wreath. Adorable craft project! Just stopping by to say thank you for participating in the #HomeMattersParty this week and I hope you’ll come back next week. This door hanging is very attractive. 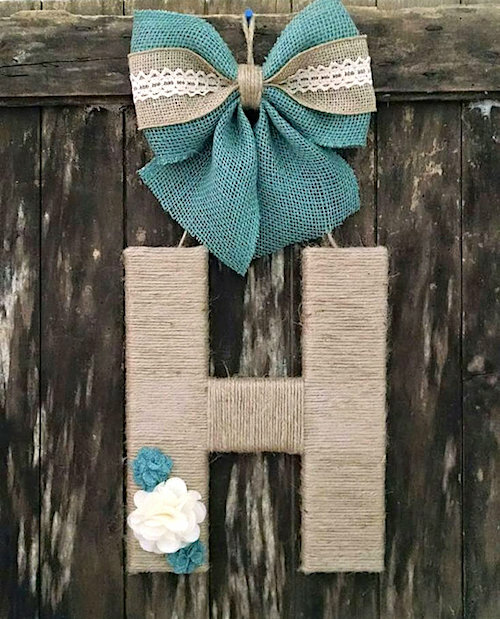 The jute twine adds a nice texture to the giant letter, and the ribbon and minimal flowers add just enough color and pattern. It’s give a nice, welcoming feeling to the front entry. This is really cute! Would make a great Mother’s Day gift!